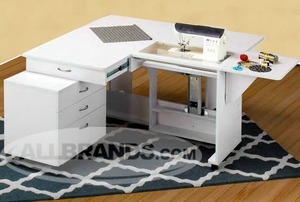 Everything you Need in one Sewing Cabinet: Extra Large Surface, Storage Caddy and Fold Down Design, and the Largest Machine Platform. . Call 1-800-SEW SERG or 800-739-7374 for details. The Quilter's Vision is designs especially for large projects that require the extra surface area to support the fabric. The quilter's Vision's surface can more than double in size by extending the front, back, and right leaf extensions. Each extension works independently an d can be positioned as needed. The included Companion Chest can be repositioned for multiple uses and provides large capacity drawers for storage. 4. All extensions have rounded, finished edges to prevent fabric from snagging. 5. Easy-roll lockable casters are attached to a reinforced base frame. 6. The Companion Chest is free standing and can be positioned for best use. It features large capacity drawers and measures 26” W x 18” D x 24” H.
8. All drawers feature full-extension steel drawer glides. 9. A custom sized acrylic insert for flatbed sewing is available by adding the Sew Steady Insert. 10. The machine platform is supported by a heavy-duty, 3-position, touch release airlift that allows for ergonomic center needle position sewing. The Companion Chest is free standing and can be positioned for best use Features 3 drawers, on 4 rolling Casters. I love the cabinet and the workmanship on it.